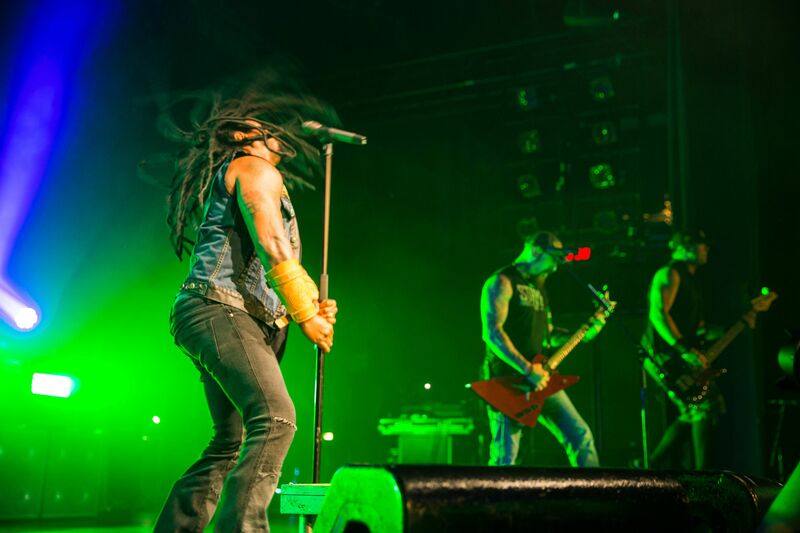 No strangers to LocalBozo.com, five piece heavy metal powerhouse band Sevendust scorched everyone in their path at Times Square’s Playstation Theater on Tuesday night. 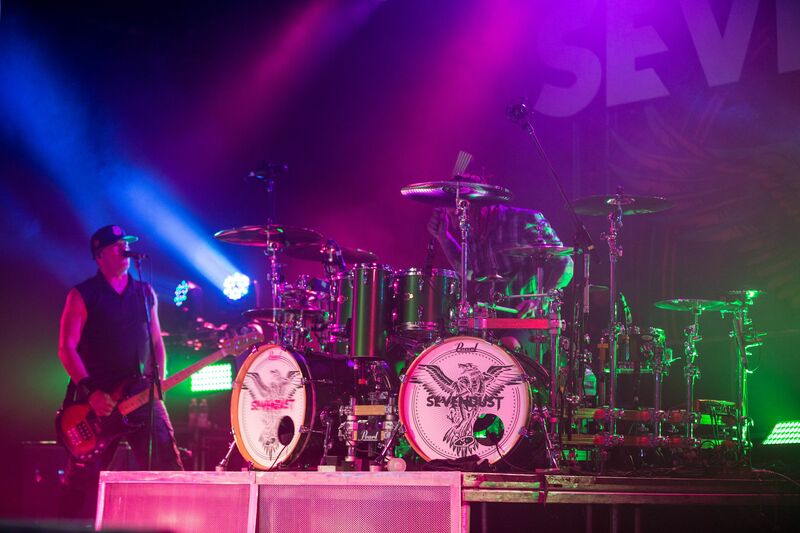 On tour in support of 2015’s ‘Kill the Flaw’ which dropped in the fall, New York City was one of the first stops on the 23 city headlining jaunt that kicked off last month after a run of support dates opening for the mighty Godsmack. The transition to the top of the marquee proved to be seamless for one of the genre’s hardest working and longest running acts, as the veterans dominated midtown Manhattan with an abbreviated by powerful thirteen song set spanning the groups two decades together in the horns-raising limelight. 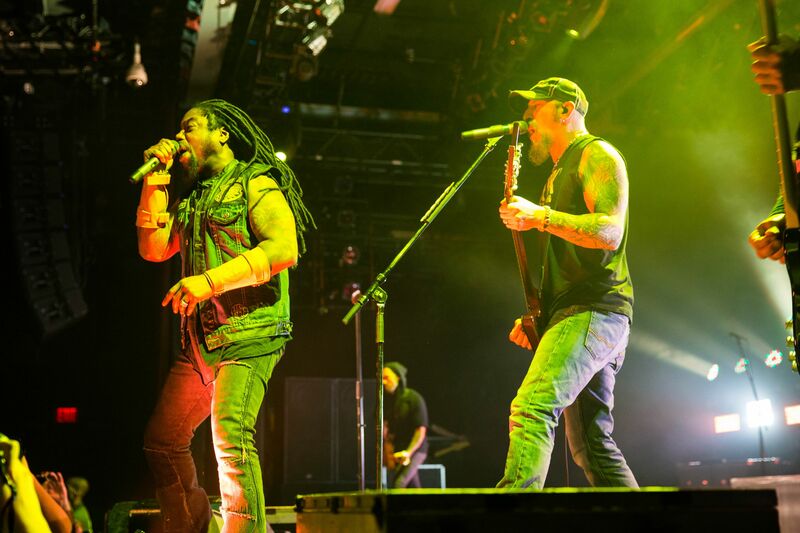 The New York City market has proven to be a second home for Sevendust with routine sell out shows coming with nearly every visit for their energetic metal shows and even for their acoustic ones. Fortunately, Tuesday night’s stop would be a return to form and as such, the excitement began building long before the band even hit the stage. 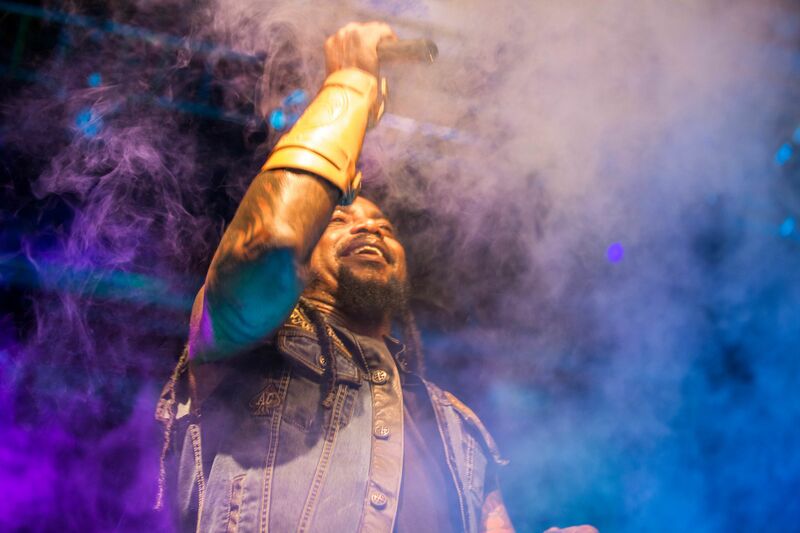 A large screen shrouded the band’s instruments and most lines of sight from the crowd as thick fog began to engulf the entire front of the house. 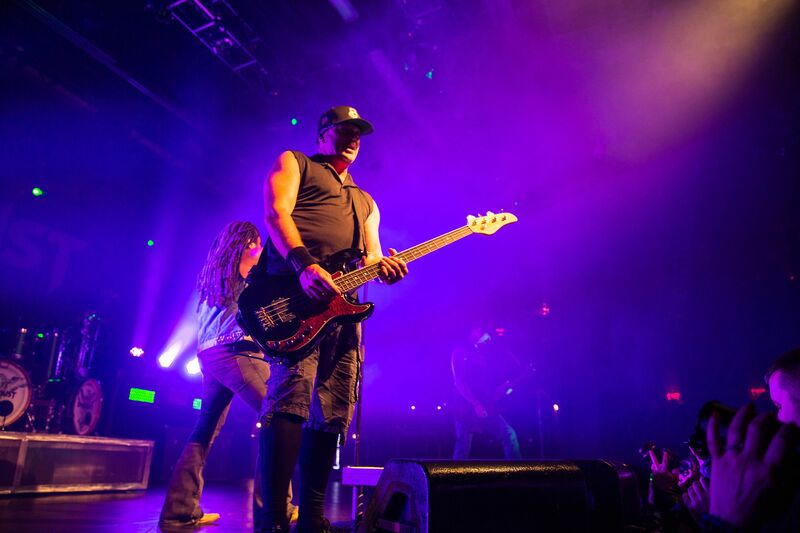 The standing room space then became saturated in green light as an ominous bass line began to play over the PA. This continued for several minutes accompanied by a deafening “Sevendust” chant from the eager audience. As if the crowd’s cadence summoned them, silhouettes began to appear through the screen and the band kicked off the night with the hard hitting “Not Today,” a pummeling opening number. The group, cloaked in shadow for most of the song was greeted with thunderous roars and raised fists as the screen dropped. “Are you ready New York City?” Lajon Witherspoon challenged. 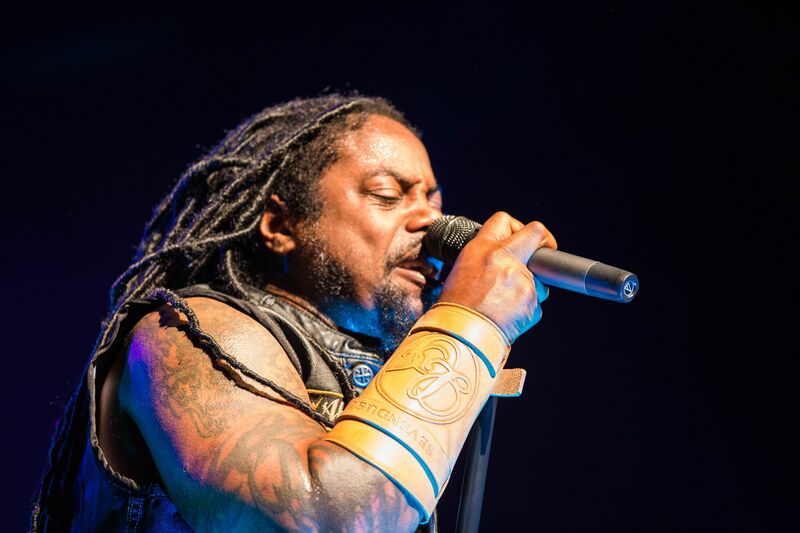 Clad in denim, leather forearm braces and his signature dreadlocks, Sevendust’s frontman dominated the stage with his commanding and gruff vocals. 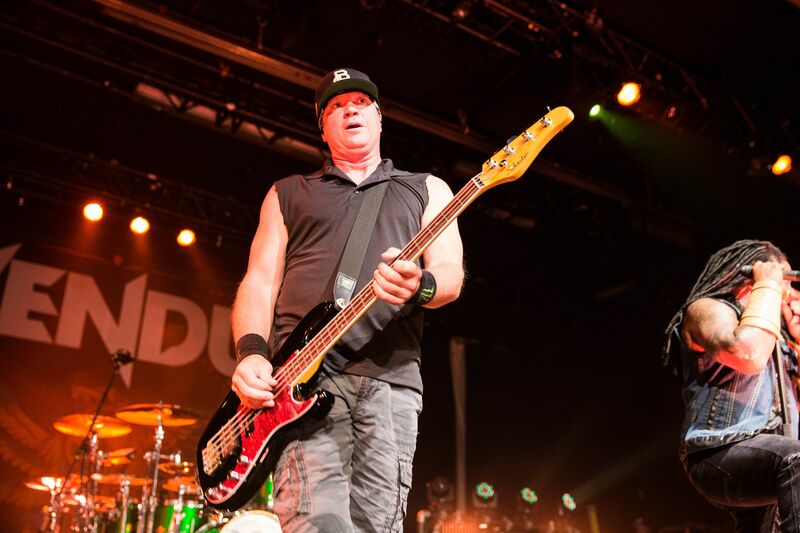 By the time they got into their second song of the night, “Home,” bassist Vinny Hornsby was in full groove, both on the strings and with his movement across the stage not leaving an inch of its real estate unexplored. Hornsby was flanked on each side of the stage by the band’s guitarists and riff writers Clint Lowery and recent LocalBozo.com interviewee John Connolly. The two six string slingers feverishly wore down their fret boards as “Home” segued into atypical show closer “Face to Face,” allowing the live crowd to hog the majority of vocals. Tucked in the back but far from in the background, drummer Morgan Rose was a true display of a heavy metal metronome with his quasi-braided hair flailing about due to the residual energy all of his limbs banging away on the skins. 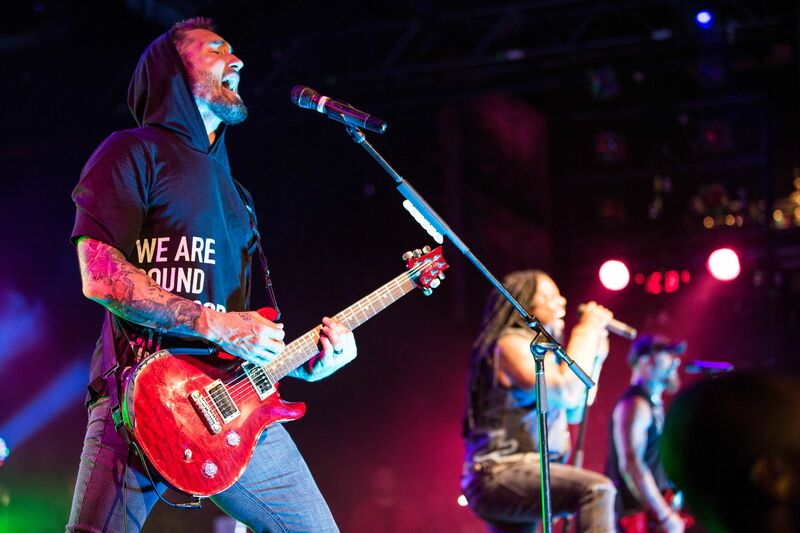 Individually each member brings an incredible energy and presence to the stage, but the sum of Sevendust is greater than its parts. After the scream laden choruses of “Ugly,” the quintet went acoustic for their 1999’s “Denial,” a perpetual crowd favorite. Heaviness would quickly resume though with distortion riddled locomotives “Disease” and the pleasant return of “Dead Set” from 2001’s ‘Animosity’ to the live tracklist. The stirring “Angel’s Son” was quick to follow, an always poignant and heart-wrenching track for Witherspoon, who used his ample mic time to dedicate the song to the memory of Prince. While it was a semi-somber and sobering moment, the act was an honorable one and a much deserved payment of homage to the late artist. 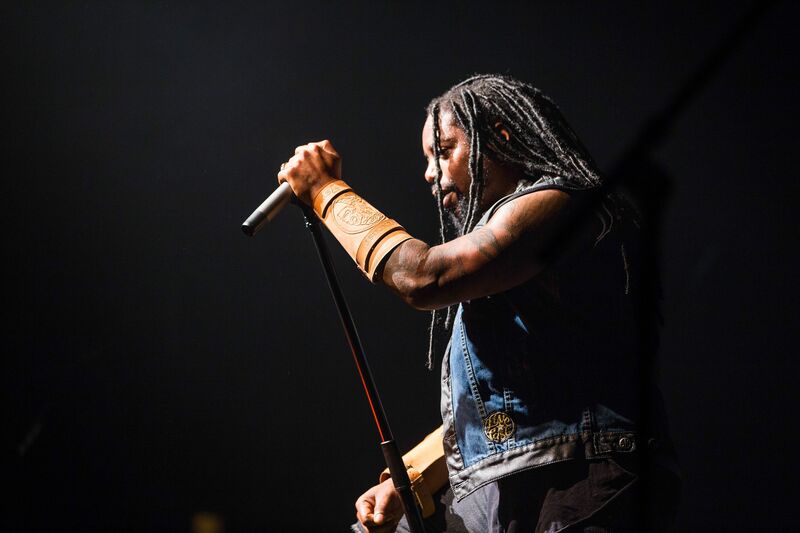 The setlist that spanned roughly seventy minutes was a brief but powerful ride through Sevendust’s ten studio releases. Fittingly as the end of the night drew near, headbang inducing soundwaves generated from “Enemy” and “Waffle” enveloped the room building up the energy to a peak for set closer “Thank You,” the monster single from ‘Kill the Flaw.’ Times Square is no stranger to lights, loudness, and action but if it were Sevendust would be a perfectly appropriate crash course in all three.